Fiber Raceways are an overhead system of plastic troughs that are used to route, protect, and manage fiber optic cables. 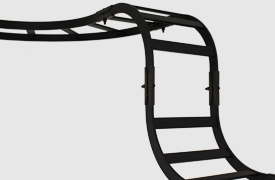 Save time & labor with a flexible raceway system that snaps together without tools. Trust components that won't rip the cable's outerjacket or compromise the cable's bend radius during installation. Cable safety & protection are built into every piece of Belden's raceways. Avoid harming staff & transmission equipment with products that are self-extinguishing and halogen free. Belden's raceways are certified to UL94VO & ROHS specifications. Belden’s LSZH Fiber Raceway portfolio offers a tool-less, flexible system that provides complete protection of the fiber cables. 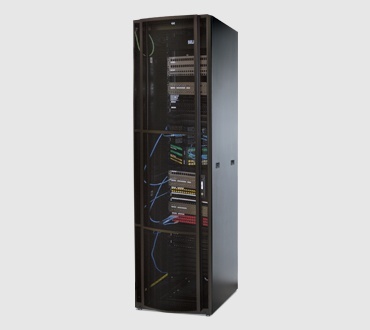 Our design tool suite enables data centers to quickly configure their network, ensuring that no components go unseen. 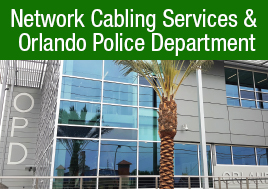 Network Cabling Services efficiently designed and deployed a robust, futureproof network to support innovative technology at Orlando PD. Universal-style 250 cable runway. 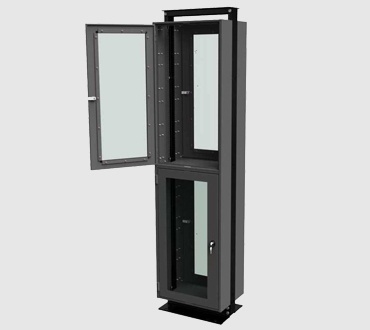 The maximum load capacity when supported every 5' with minimal deflection is 132 lbs/ft. Welded steel tubing construction, individually boxed. Side stringer: 1.5" x 0.375" x 0.065"
Telco-style 252 cable runway. The maximum load capacity when supported every 5' with minimal deflection is 132 lbs/ft. Welded steel tubing construction, individually boxed.